Désolé... Cet article n’est pas disponible dans votre langue. Your Outlook mailbox is only so big, and it’s a good bet that you won’t stop getting email anytime soon. 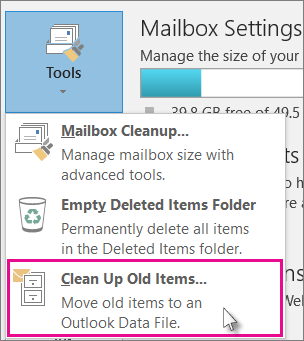 To keep it from filling up, you can move old items you want to keep to an archive, a separate Outlook Data File (.pst) that you can open from Outlook any time you need it. Note: The Archive command and feature doesn’t appear for any account in your Outlook profile if you include an Exchange Server account and your organization uses Microsoft Exchange Server Online Archive. Your network administrator can also disable this feature. 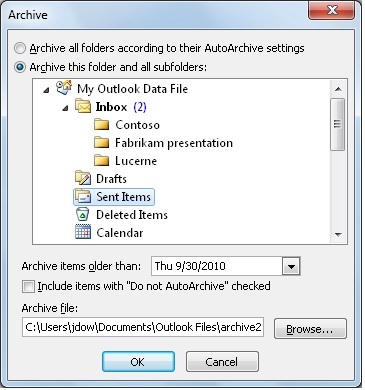 By default, Outlook uses AutoArchive to archive items at a regular interval. To learn more, see Archive older items automatically. You can also archive items manually whenever you want. That way, you can control which items to archive, where to store them, and how old an item needs to be before it can be archived. 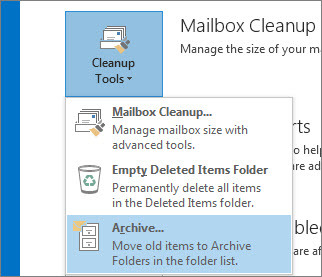 In Outlook 2013: Click File > Info > Cleanup Tools > Archive. Check the Include items with “Do not AutoArchive” checked box to archive individual items that are excluded from automatic archiving. This option doesn't remove that exclusion from these items, but instead ignores the Do not AutoArchive setting for this archive only. Uncheck the Run AutoArchive every n days box. By default, older Outlook items archived automatically on a regular interval. To learn more about AutoArchive, see Use AutoArchive to back up or delete items. Click the Archive this folder and all subfolders option, and then click the folder that you want to archive. Any subfolder of the folder you select is included in this manual archive. If you do not want to use the default file or location, under Archive file, click Browse to specify a new file or location. Browse to find the file that you want, or enter the file name, then click OK. The destination file location appears in the Archive file box. Select the Include items with “Do not AutoArchive” checked check box to include any items that might be individually marked to be excluded from automatic archiving. This option does not remove that exclusion from these items, but instead ignores the Do not AutoArchive check box for this archive only. On the Advanced tab, under AutoArchive, click AutoArchive Settings. AutoArchive, which is turned on by default, automatically moves old items to an archive location at scheduled intervals. However, you can manually back up and archive items to a location that you specify. Note: The Microsoft Office Outlook 2007 AutoArchive settings are customizable. Rather than backing up or archiving your items manually, you may find that AutoArchive can meet your needs. For more information, see Using AutoArchive to back up or delete items. On the File menu, click Archive. Select the Archive this folder and all subfolders option, and then specify a date under Archive items older than. Under Archive file, click Browse to specify a new file or location if you do not want to use the default file or location. Select the Include items with "Do not AutoArchive" checked check box if you want to override a previous setting to not automatically archive specific items. If you choose to manually archive these items during this procedure, the items will again be subject to the Do not AutoArchive setting unless you manually override that setting again in the future. 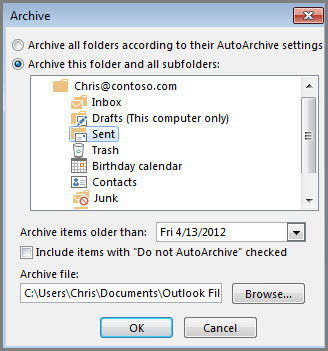 Note: Outlook automatically creates another archive file for items in the folder and location specified.